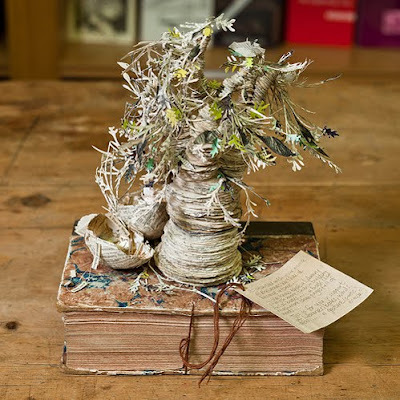 Several people have contacted me about this story of the mysterious book sculptures which have been appearing at libraries in Edinburgh, Scotland. As it's made its away around facebook and twitter, I thought it might already be familiar to many. However, it's just too good a story not to share. More have appeared in libraries and book places in Edinburgh. Garry Gale of the Music Library in Edinburgh deduced the creator as the pieces looked like one he had previously purchased from an artist. Instead of revealing the identity, the Edinburgh Evening News polled its readers: Do you really want to know, it asked its readers, who made these gorgeous teacups and dragons and magnifying glasses, or would you rather honor the artist, and let him/her remain anonymous? They said no.